We have come to a very good agreement with the Embassy Suites Nashville-Airport Hotel to hold our Nashville Meet-up on Saturday and Sunday, 20th & 21st March 2010. The rooms are blocked for us as noted below for $99/night on the 19th - 21st March; in addition, anyone interested in getting the same rate 2 days prior and/or 2 days after (from 17 March thru 23 March) can do so subject to availability, as long as it is booked by February 28, 2010. Due to the holiday period, the final arrangements to book your hotel stay have been delayed. However, the Sales Manager tells me that since the contract between MeBO and the Embassy Suites Nashville-Airport Hotel agreeing to the terms below has been signed, we should be able to begin booking our individual suites as of Monday afternoon. Please do not book until the beginning of next week when I have posted the booking process post. 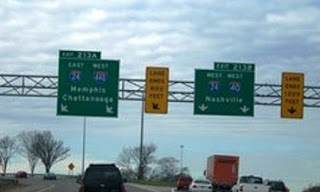 See other posts in this blog about the Nashville 2010 Meetup. Here is what MeBO Research and the Embassy Suites Nashville-Airport have agreed upon for our meetup. Each 2 room suite features a parlor with a sofa bed (double bed), a king or 2 double bed room, wet bar, bathroom, marble vanity and sink in bedroom, 2 TVs (one in bedroom and parlor), and more. Each king size bed suite can accommodate up to 4 people using the double bed size sofa bed, and up to 6 people in 2 double beds and sofa bed. Meetings will be held in Governor’s Suite. No one has to pay anything in advance for the rooms, though we may need to raise funds from the attendees to cover lunch catering and the use of the Governor's Suite to meet. This may be approximately $10-$25/day (Saturday and Sunday only)? We have yet to negotiate rates with the caterers, so more information will be forthcoming regarding this. Each person reserves his/her suite guaranteeing suite/rate with a credit card, though your card will not be billed until you check out after your stay. No penalties apply for cancellations per suite up to until 6:00pm on the day reserved for check-in. And in that case, the credit card used to reserve and guarantee the room will be charged one night's stay. MeBO will not be responsible for this fee. According to the terms of the contract, twenty one suites will be blocked for the meetup until 28FEB10. Reservations are to be made by individuals no later than Friday, February 28, 2010. After that date, the suites not reserved by the meetup attendees will be released by Embassy Suites for their general sales. Then anyone who wishes to book for the meetup after February 28th will be subject to availability and to current rates. I will guarantee the Governor's Suite with my credit card. 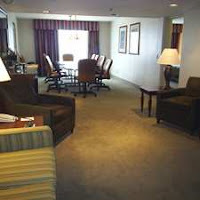 Since members will be welcome to get together in this room between 12:00 noon and 5:00pm, I will be staying in this room as opposed to renting a regular suite for $99.00. Therefore, the remaining $50/day (Saturday and Sunday only) and lunch catering cost can be covered with a predetermined donation (to be calculated after consulting with the caterers) from each member attending. Currently it is planned that two members who are flying in from London to share in this meet-up with us will also share this room with me. We will meet in the Governor's Suite from 12:00noon through 5:00pm, Saturday and Sunday, since the full complimentary breakfast will be served until 10:00am, and the Manager's Reception is from 5:30pm to 7:30pm at the Hotel Atrium. However, if the group prefers, we can go sight-seeing on Sunday at any time. We can arrange in advance catering for lunch during the meetup. Some of our international members who could not attend have requested that we set up a audio/video conference while we meet in the Governor's Suite, perhaps for a limited time only especially during interesting discussions, in order that they may also participate. Since some of us may not wish to come out on camera, we can point the webcam in a direction where only those who do wish to be visible (if anyone does) can do so, and others would not. Those of us who do not wish to be seen or heard would stand away from the webcam and further away from the microphone. If anyone objects to this, please let me know, and we will do all possible to accommodate. Photography will be limited to sights and out of respect for others, NO MEMBER MAY BE PHOTOGRAPHED WITHOUT HIS OR HER PERMISSION. I look forward to seeing everyone at the meeting and sharing special moments with each one. I see that 14 people have taken the poll and said they would be attending, and many have emailed me expressing interest as well. If you have not done so yet and are planning on attending, please indicate it in the poll below. I think it's going to be a very memorable experience for us all!